Sawa is an alternative pop rock indies singer songwriter quickly making a name for herself in Japan and abroad. She originally formed a band also named SAWA featuring herself on vocals and guitar, accompanied by Zizi (Guitar/Chorus) and other friends. Their sound could range from sweet sounding yet haunting ballads. To uptempo futuristic sounding grooves. Their first album “Three Three Three” was released in May 2009 to a very good reception. However after release of their EP “Figure and Shadow” the band went their separate ways. In 2010 Sawa and Zizi have formed a new band, SAWAS PHOOL (pronounced “fool” but is Hindi for flower) making their debut at JIN Radio’s live indie music show. 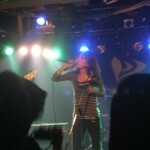 Lead singer Sawa, who has lived in the US, is bilingual and has performed in both countries. She has written and performed songs in both English and Japanese, bringing a strong international flavor to the Japan Indies scene. They are currently working on new songs to present to the world. Check them out soon!